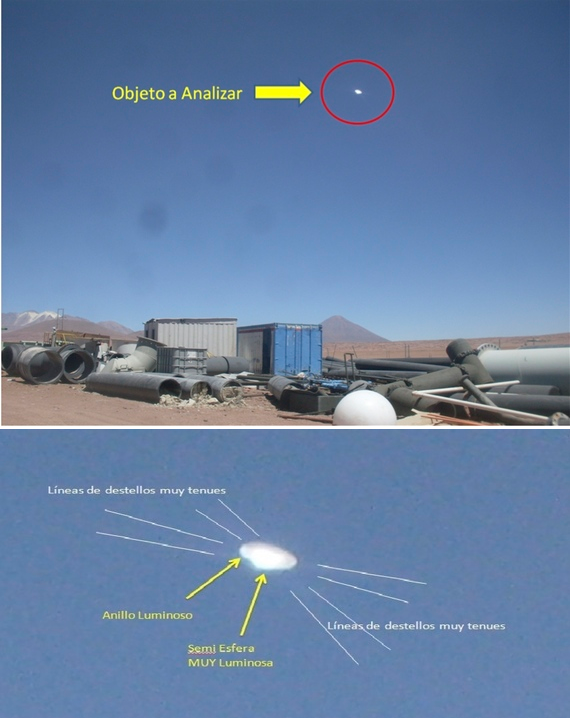 Analysis done by a government office on the UFOs in Chile above a remote copper mine has been released. The investigation has started with two high quality photos showing the strange aerial objects above the area. Committee for the Studies of Anomalous Aerial Phenomena (CEFAA) is the office, which is under Chilean Air Force jurisdiction. It is located within the Ministerial Department of Civil Aeronautics (DGAC), which is equivalent of FAA. Its main function is to investigate selected unexplained aerial activities in Chile’s airspace, most of these reports were from aviation personnel and pilots. The photos were taken at over 14,000 feet above sea level, at the Collahuasi copper mine in the Andean plateau, located far north of Chile. The area is desolate and inhospitable with its low level of oxygen. It is extremely remote location with unusually clear skies. In April 2013, four professional technicians specializing in electronics, electricity and fluid control were working in the area. They saw a disc-shaped object approaching slowly and was visible to them in more than an hour. The object moved in different positions and hovered at around 2000 feet. The mysterious object was flying without a sound and eventually moved away towards the East. One technician managed to take pictures using a Kenox Samsung S860 camera. The witnesses chose not to share what they saw because of fear to be ridiculed, but few months later the photographer showed the pictures casually to the chief engineer at the mine. The engineer then sent the images to the CEFAA in February and provided information from the witnesses. The engineer, same with the witnesses, requested anonymity. It was confirmed by the country’s meteorological office at the DGAC that the sky was absolutely clear when the activity reportedly happened, ruling out the possibility of lenticular clouds. Chilean officials ruled out all other meteorological phenomena as a possible explanation. CEFFA officials ruled out drones, experimental aircraft, weather balloons or anything terrestrial in origin that could explain the incident. They explain that people in the area know about drones as fishing companies use drones but unlike what the witnesses reported, these drones make a lot of noise. CEFAA determined to analyze further the photo with all conventional explanations ruled out. The result of the study was posted on the CEFAA website. The study concludes that it is a phenomenon or an object of great interest and it can be qualified as a UFO. This is FULL A Fckn Sh@t Period….That Is NNO0TT A UFO….It Is FAKE,FRAUD Like The Government Fake,Fraud Period…. Calm down, DrkRydr00. What are you so angry about?